I have some news, you guys. It's the latest installment of my probably-inconsequential observations about the human experience. At least for today. For a while, I think the majority of America didn't have access to hipsterdom. But it's not their fault. Until recently, the radio didn't play bands like Of Monsters and Men or Gotye or Bon Iver. Thick-rimmed glasses didn't really see the light of suburbia. But I think because hipster culture is being pushed into the spotlight (I say pushed because I imagine it is unwelcome), the masses are more and more aware of it. I think knowing about hipster culture and subsequently mocking it is the new referencing-Facebook-in-real-life. What I mean by that is, we used to reference Facebook in casual conversation as a way to note that we were in on The Latest Thing. This was before Facebook just let any yahoo with an email address sign up. No, no. These were the good ol' days, when Facebook was just for college students and app invites and timelines didn't exist. Remember Mini-Feeds? Remember our outrage? Sigh. If there was a Facebook Purist Party represented in this election, I would totally vote in favor of that person. Anyway. Back in, say, 2007, we bashfully-but-secretly-cleverly threw out phrases like, "tag me!" and "wrote on my Facebook wall" both to ensure we got a copy of that picture from the party and to demonstrate the fact that we were ON FACEBOOK you guys. Now Facebook is so engrained in our culture it's no longer clever to refer to it. So I propose that mocking hipster culture is now serving that purpose. It made an appearance in Taylor Swift's new song. I've seen "hipster" be a party theme multiple times via Facebook photos. It's woven throughout my news feed in the form of jokes. * It's all over Stuff Christians Like (sorry Jon. I'm not complaining, but it's true.). And you know when something has permeated Christian pop culture (it's a thing), it is officially behind the cool kid curve. I'm not really sure what my point to this is other than to recognize that this is happening. Though I will say that lately my definition of a hipster has gotten a little hazy. I feel like it's probably not hipster to be a cliche hipster, which now exists thanks to all the reasons I've mentioned above (Includes, but not limited to: fixed gear bicycles, holga cameras, thick-rimmed glasses, vintage clothes, ironic mustaches, vinyl records, suspenders). 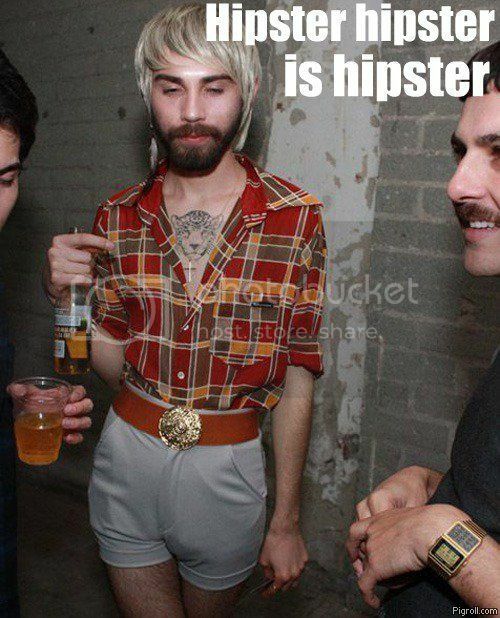 So what is a true hipster? Are all stylish 20-somethings in Nashville hipsters? Is my view totally skewed because I live in Nashville? I wear lots of v-necks and unnecessary scarves. Am I a hipster? This is getting super meta and existential and I think I need to get out while I can. Have you noticed this trend? Where have you seen it play out? *Why did the hipster burn his tongue? He drank his coffee before it was cool. HEYO.